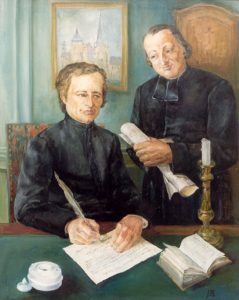 On June 6, 1819, Fathers Gabriel Deshayes and Jean-Marie de la Mennais signed a “treaty of union” at Saint-Brieuc where they pooled their energies “to procure for the children of the people, especially those of the Breton countryside, firmly pious teachers”. The first, Gabriel Deshayes, Parish priest of Auray, had already trained several young men to become teachers of the countryside, according to the pedagogical method of La Salle Brothers. At the request of Jean-Marie de la Mennais, Vicar-capitary and administrator of the diocese of Saint-Brieuc, he had provided him with two teachers to open a school at Pordic, and in early June 1819 he accompanied three other young people to found a Christian school in Dinan. The two Novitiate houses of Saint-Brieuc and of Auray will be directed respectively by Father de la Mennais and Father Deshayes. The two houses will follow the same Rule, the same teaching methods, and indeed will constitute a single house. Each of us will direct and supervise all the Brothers placed in his dio­cese and those he will assign to other dioceses. When we deem it opportune, we shall choose from among the Brothers a Superior and two Assistants and shall decide on their place of residence. If this has not yet been done at the death of one of us, or if for any rea­son one of us cannot participate, the choice and arrangements for the good of the society will be made by the other. As soon as possible, we shall try to find a house which is centrally located for the two dioceses, not too far from a main road and preferably in a rural area. Each of us will arrange that at his death all resources remaining for his house will pass to the survivor, who will put them together with his own for the support of the society. Drafted in duplicate at Saint-Brieuc on Trinity Sunday, June 6, 1819.